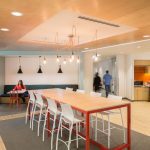 Howell completed an 80,000 square-foot, multi-phased, tenant improvement project in an occupied building on Floors 1 and 2 for CableLabs. 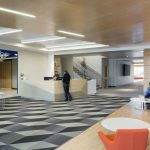 The project included complete reconstruction of the lobbies on both floors, labs, executive offices, video conference rooms, and modifications to the existing MDF/IDF rooms and data center. The project was completed in four phases to allow the client to utilize a swing space to maintain operations throughout construction. The details of this project include the installation of DIRTT wall systems on both floors, high-end finishes (millwork, lighting), and special acoustical materials for privacy. 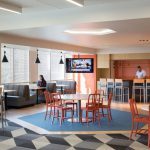 The new space serves as the corporate headquarters for CableLabs.